Fattening a chicken is sometimes necessary if you are raising chicken for market or if you have an egg-laying chicken that is underweight. Natural ways to fatten a chicken may take more time and money than chemical ways, but will guarantee a healthier chicken overall. Feed and grain stores sell an all-natural "meat builder," which is also called "finisher." This product is specially formulated to fatten a chicken in the weeks prior to it being slaughtered. It does not contain chemicals. It also gives the chicken extra nutrition, making for a better tasting chicken. Chickens will eat feed as long as it is available. Giving your chicken more feed and more fresh water will keep it eating more frequently and in greater quantities. 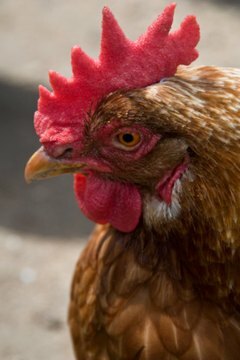 Give chickens normal feed in larger rations than normal when trying to fatten up the chicken. Chickens will not always fatten up on feed alone. You can supplement what you give the chicken to help it fatten up more. Cracked corn, whole wheat and soy can be fed to chickens throughout the day. These items help to pack on the weight. Chickens can be fed mash, pallets and crumbles. They should also have constant access to grits. If the weather is cool, corn or starch can help warm them up.